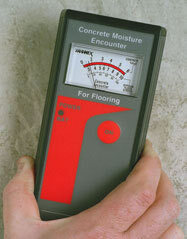 Concrete Moisture Meters are for measuring moisture content in concrete floors and floor screeds. Concrete structures are porous so they can absorb moisture. It is therefore often necessary to measure and monitor the moisture content within the concrete. Regular checking of moisture content during the drying out period of a new concrete floor or floor screed is important to ensure it has reached sufficient dryness to accept the floor covering. Excess moisture in the concrete could cause latent problems such as condensation or failure of the adhesive under the floor covering. BAMR supplies Concrete Moisture Meters that will give you an instant reading of moisture content up to 6% concrete; up to 0 – 10 comparative on gypsum screed, enabling you to make an informed decision on when to install the floor covering. As many non-destructive tests as you need, can be carried out in seconds without the need to drill or damage the concrete. The Concrete Moisture Encounter is for measuring moisture content instantly in concrete floors and floor screeds without the need to drill or damage the surface. The Moisture Measurement System (MMS) is a new product for measuring moisture conditions in buildings to aid understanding of how and why damp conditions may prevail. It combines moisture meter and hygrometer functionality in one state-of-the-art instrument for a complete moisture surveying capability. Knowledge of the moisture content of soils and construction materials is of great importance to engineers involved with the construction of roads, bridges and other civil structures, throughout the world. 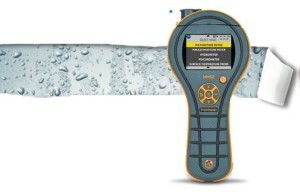 The Speedy Moisture Tester is used on construction sites to establish the percent moisture content (%MC) of these materials before the actual construction work commences.The Speedy Moisture Tester is a portable-sampling instrument used to determine the moisture content of a broad range of materials. It comprises a hand held vessel incorporating a pressure gauge and a precision balance, mounted in an integral carry case.